This page contains affiliate links. If you purchase anything through these links, we will earn a small commission at no additional cost to you. Thank you. The title of this post came from a quote that caught my attention; it is either attributed to Joe Vitale or Joe Vitale reading Robert Anthony’s material. I’ve talked a little bit about Robert Anthony’s The Ultimate Secrets of Total Self-Confidence before, and I think it is a great book, but the more definitive guide, as I’ve been finding out, is Beyond Positive Thinking: A No-Nonsense Formula for Getting the Results You Want. I have been listening to the audiobook version in which Joe Vitale narrates. It’s an excellent book. 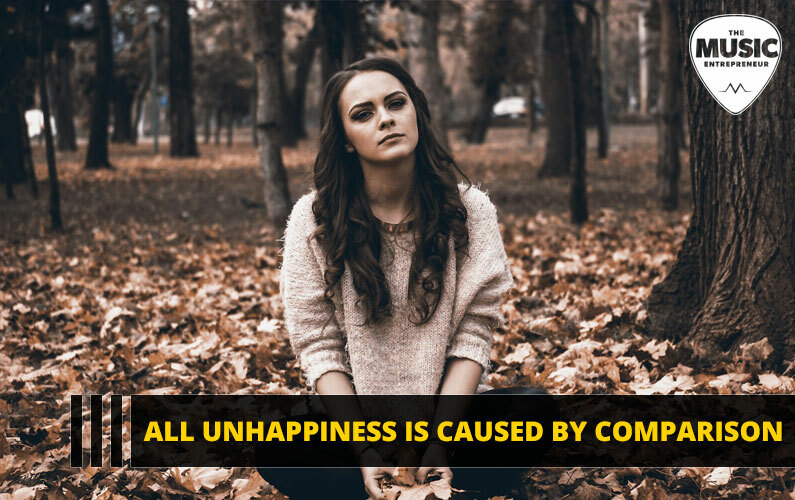 In any case, I think the idea that all unhappiness is caused by comparison is worth pondering further, especially in a world where it’s so easy to see what others have accomplished, and feel insecure about your own achievements. What if There Was Nobody Else to Compare Yourself to? Just imagine for a moment: If there was no one else living on this planet and you had no one to compare yourself to, how would you feel? You might feel lonely. You might feel sad. But there would be no reason to feel a lack of self-confidence. After all, you would be unique! There would be no one else like you. You would feel free. Each of us is a unique strand in the intricate web of life and here to make a contribution. You have a unique contribution to make to the world, though it’s possible you haven’t identified your purpose yet. So, Why do we Compare? Comparison is linked to insecurity or fear. It’s the idea that some people are better than you and some people are worse than you. After all, the only way to compare is to lift some and diminish others. If some people are better than you, then there is certainly some people that are worse than you. This is the very definition of arrogance. We compare because our ego prompts us to compare. When we identify as our ego, we only pay attention to surface-level matters. Everything becomes about who we are and where we stand relative to others. Our ego is not our identity. How do we Avoid Comparison? Every person on this planet has different skills, different abilities, different talents, different qualities, and different capacities. We all look a little different, even though we might notice some similarities in physical appearance. Fundamentally, we are all a little different. It has often been said that variety is the spice of life. This applies to people too. It’s okay to be different. You aren’t someone else. Therefore, it’s much more freeing, and more productive to embrace who you are. The most common symptoms of comparison are jealousy and insecurity. Are you jealous of what someone else has accomplished? Are you insecure about yourself, and what you wish you could be? Don’t wish you could be someone else. Instead, make the most of what you’ve got! The main problem with comparison is that it eliminates gratitude from your heart. A lack of gratitude diminishes love. A lack of love leads to a miserable life. The reason comparison gets in the way of gratitude is because it gets in the way of being thankful for who you are and the gifts you have been blessed with. Everybody has gifts that are waiting to be developed, but not everyone chooses to work on them. Yes, your gifts must be developed. The responsibility is yours! Gratitude unlocks love, but it also unlocks joy and a whole host of other blessings. If comparison is the cause of unhappiness, gratitude is the chief cause of happiness. Learn to be thankful for who you are and what you have. Instead of criticizing others, we should learn to allow and/or praise. Whatever you focus on expands in your mind, so the more criticism you dish out, the more it will grow in your consciousness. If someone is genuinely good at what they do, offer them praise. If you can’t bring yourself to like them, then don’t dwell on it. Instead, just allow them to be. Allowing creates a free flowing energy in our lives that can call forth fresh blessings. The solution begins with yourself. Develop a healthy self-image. Be confident in who you are. Enjoy your gifting and abilities. Choose to work on yourself, and don’t become too fixated on others. If you’re comparing yourself to others, you are not focusing on the right things. Finally, take your focus off of yourself. Go out and serve others instead. Putting smiles on people’s faces will change your life.